After cruising for a couple of weeks in the hot and humid Caribbean, I was excited to see a lovely layer of snow when I returned to Southern Georgian Bay. I was so excited that I went ahead and registered our club to host an event on the World Snow Day website. Our event is called Free To Ski and it will take place on Sunday, January 20th, 2019. Everyone is invited to come out to Sawmill Nordic Centre for a day of fun in the snow. This will be a day to bring your whole family and friends to ski or snowshoe on our trails. 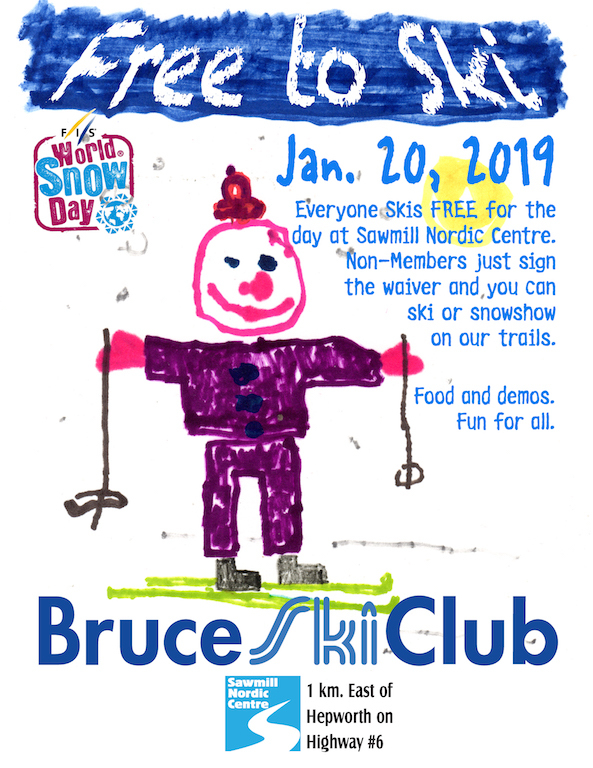 It does not matter if they are Bruce Ski Club members or not, because everyone is invited to ski for free on that day. Non-members will be asked to sign a waiver. We are still planning and organizing what will take place, but we hope to have soup and other food available, as well as demos, waxing, as well as a few more surprises. More information will follow as we get closer to the day. If you are interested in volunteering to help with greeting newcomers, giving tours, parking attendant or other volunteer functions, please contact myself at: hakalathomas@gmail.com or Mike Campbell at: mike@bruceskiclub.ca. Let’s make this an event to remember.